Last Wednesday, airstrikes obliterated Al Quds Hospital in Aleppo. They blew apart at least 50 men, women and children. It killed one of the last remaining paediatricians in the city. There were almost 300 airstrikes in Aleppo over the last 10 days. Civilians, often in crowds, were repeatedly struck. What are individuals in wars today? Expendable commodities, dead or alive. Patients and doctors are legitimate targets. Women, children, the sick, the wounded and their caregivers, are condemned to death. The MSF Kunduz Trauma Centre in Afghanistan was attacked on 3rd October 2015. In the hours before the airstrike this room would have been full of patients and their caretakers. I went to Kunduz, Afghanistan following the U.S. attack on our trauma center on October 3rd, 2015. One of the survivors, an MSF nurse whose left arm was blown off during the relentless airstrike, told me something that haunts me daily. He said that when fighting erupted in Kunduz, MSF told its staff that its trauma center was a safe place. I told him that until October 3rd, I truly believed that the hospital was a safe place. I cannot say that anymore about any medical facilities on the frontlines today. 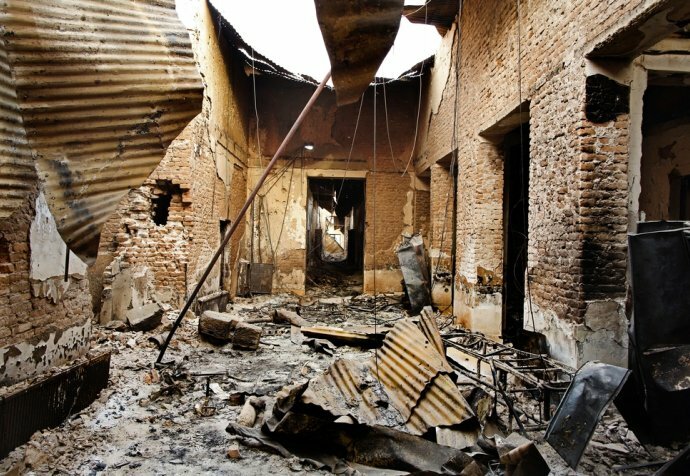 In Afghanistan, the Central African Republic, South Sudan, Sudan, Syria, Ukraine and Yemen, hospitals are routinely bombed, raided, looted or burned to the ground. Medical personnel are threatened. Patients are shot in their beds. Broad attacks on communities and precise attacks on health facilities are described as mistakes, are denied outright, or are simply met with silence. In reality, they amount to massive, indiscriminate and disproportionate civilian targeting in urban settings, and, in the worst cases they are acts of terror. The effects of the attacks against health facilities emanate far beyond those immediately killed and injured. They demolish routine and lifesaving healthcare for all. They make life impossible. Full stop. On October 26th, 2015, a Saudi-led coalition airstrike hit an MSF hospital in Haydan, in the north of Yemen, leaving at least 200,000 people without lifesaving care. It was the first of three MSF facilities partially or completely destroyed in Yemen over a period of three months. Attacks on MSF facilities provide only a glimpse into the brutality of war. Attacks on other hospitals and clinics—and schools, markets, houses of worship—are routine. Local health workers bear the brunt of these abuses. We are at a deadly impasse. We can no longer assume that fully functioning hospitals—in which patients are fighting for their lives—are out of bounds. Hospitals and patients have been dragged onto the battlefield. In Jasim, a town in Southern Syria, citizens have protested in front of a hospital to prevent its re-opening. They know what happens to functioning hospitals. We are facing an epidemic of attacks on health facilities, impeding our ability to do our core work. And to date, our calls for independent investigations have gone unheeded. Accountability begins with independent and impartial fact finding. Perpetrators cannot be investigators, judges and juries. Make no mistake: we will relentlessly denounce attacks on healthcare. We will speak out loudly and with force about what we witness in the field. Medicine must not be a deadly occupation. Patients must not be attacked or slaughtered in their beds. We physicians take an oath when we join the medical profession. We treat every individual, regardless of who they are, regardless of their religion, their race, or on which side they may fight. Even if they are wounded combatants, or if they are labelled as criminals or terrorists. To turn our back on these basic principles is to turn our back on the foundation of medical ethics. Medical ethics cannot be buried by war. The neutrality of war-time medical care cannot be stamped out by state sovereignty or domestic law. Especially in an age of counter-terrorism and counter insurgency – characterized by shifting alliances and murky rules of engagement. While the nature of warfare may have changed, the rules of war have not. You are charged with protecting peace and security. Yet four of the five permanent members of this council have, to varying degrees, been associated with coalitions responsible for attacks on health structures over the last year. These include the NATO-led coalition in Afghanistan, the Saudi-led coalition in Yemen, the Russia-backed, Syrian-led coalition. You therefore must live up to your extraordinary responsibilities, and set an example for all states. I repeat: Stop these attacks. The discussion here today cannot amount to empty rhetoric. This resolution cannot end up like so many others, including those passed on Syria over the past five years: routinely violated with impunity. In Syria, where healthcare is systematically targeted, and besieged areas are cynically denied medical care. Ensure the protection of the impartial provision of healthcare in conflict. Also support the obligations of health workers to treat all sick and wounded without discrimination. Dr. Maaz, the paediatrician murdered in Aleppo last week, was killed for saving lives. Today, we remember his humanity and bravery, shared by so many patients, nurses, doctors, communities and MSF staff caught up in areas of conflict. For their sake: translate this resolution into action. Re-commit -- unambiguously -- to the norms that govern the conduct of war. This resolution must lead to all states and non-state actors stopping the carnage. You must also pressure your allies to end attacks on healthcare and populations in conflict areas. We will not leave patients behind. And we will not be silent. Seeking or providing healthcare must not be a death sentence. You will be judged not on your words today, but on your actions. Your work has only begun. Make this resolution save lives.